One of the US's leading crypto-currency exchanges is carrying out an insider trading investigation. 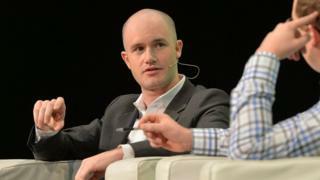 Coinbase fears its own workers may have exploited its move into Bitcoin Cash - a spin-off of the original Bitcoin. The San Francisco-based firm announced the move after Bitcoin Cash's price jumped. Coinbase began letting its users buy, sell, send and receive Bitcoin Cash on Tuesday in a surprise decision but has temporarily suspended trade. The company's chief executive intervened after several market watchers posted allegations of illegal activity on social media sites. Brian Armstrong responded that he had repeatedly warned his staff not to disclose its launch plans to family or friends or to trade in the digital asset themselves. "It appears the price of Bitcoin Cash on other exchanges increased in the hours before our announcement," he wrote on the blogging platform Medium. "If we find evidence of any employee or contractor violating our policies - directly or indirectly - I will not hesitate to terminate the employee immediately and take appropriate legal action." Bitcoin Cash - which is no more tangible than Bitcoin itself - came into being in August after several developers became frustrated at lengthening transaction times for the original crypto-currency. Bitcoin Cash addressed this problem by tweaking the underlying technology - the blockchain - to allow bigger chunks of data to be processed at a time. Although there have been other Bitcoin splits before, this "fork" was unusual in that everyone who owned the original virtual currency was offered a matching sum of Bitcoin Cash. This effectively created money out of nothing. However, many exchanges, including Coinbase, initially refused to support the innovation, casting doubt on its prospects. Claims of insider dealing were not the only hitch that Coinbase experienced when it finally added support for the new asset. Trade of Bitcoin Cash was frozen just four minutes after it began on the firm's Global Digital Asset Exchange (Gdax) and existing orders were cancelled. The move seems to have been a reaction to an apparent price surge in Bitcoin Cash on the platform beyond its already elevated level elsewhere. When Coinbase launched Bitcoin Cash at 17:20 PST (01:20 BST) it was valued at about $3,500 (£2,612) per coin. At the time it suspended it, the company was quoting a price of about $8,500. It remains unclear whether or not this was a software glitch or if deals were really being made at this level. Coinbase has yet to give a full explanation but has said that it intends to reopen Bitcoin Cash order books later on Wednesday. Bitcoin Cash is currently the world's third biggest crypto-currency with a total market capitalisation of about $59bn, according to Coinmarketcap. That compares with there being $77bn worth of Ethereum and $282bn worth of the original Bitcoin.